NMSaaS has a highly advanced Network Performance Monitoring and reporting system for networks, servers, and applications. This gives network operators the flexibility they need to collect and report KPI’s crucial to business and their customers. The software suite runs 24/7, and thereby identifies and documents the IT infrastructure performance and particular events on a real-time basis. NMSaaS also provides historical reporting to classify and pinpoint long-term trends effectively. NMSaaS is equipped with a highly flexible reporting engine and an integrated graphical report designer. The report designer supports PDF, HTML and Excel outputs and allows for fully customizable reporting to best meet specific requirements in simple point and click fashion. You may publish your reports on a schedule or on demand. SLA reports document the network operation delivery against contractual obligations. In most cases, they are not as detailed as performance reports. They are designed to only show performance at service layer; lower layer information such as the underlying transport network, is actually not part of their concept. Usage reports show utilization volume and throughput with baselines, top N, and trends. Users may understand peak and off-peak loads better by going beyond monthly totals to provide time lines. This helps to size the network correctly to meet actual demands. QoS reports help understand performance and usage per Class of Service (CoS). 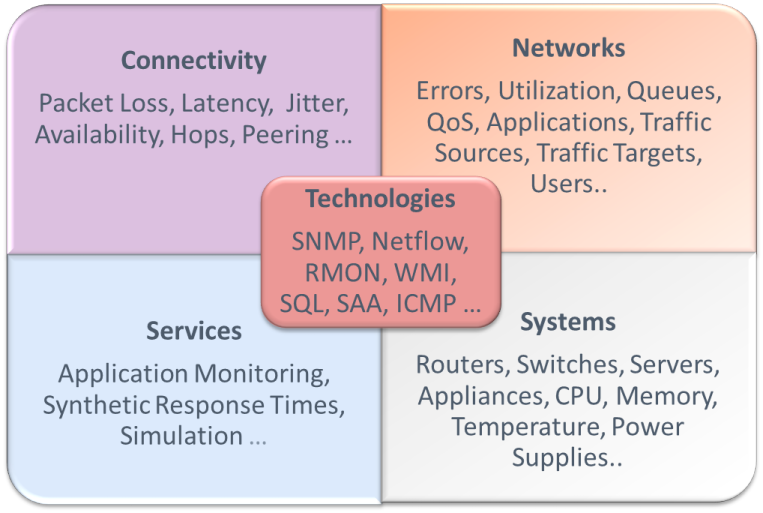 This is crucial to converged networks. In addition, QoS reports include information vital for correct classification. You can use them to fine-tune application traffic for best performance results.